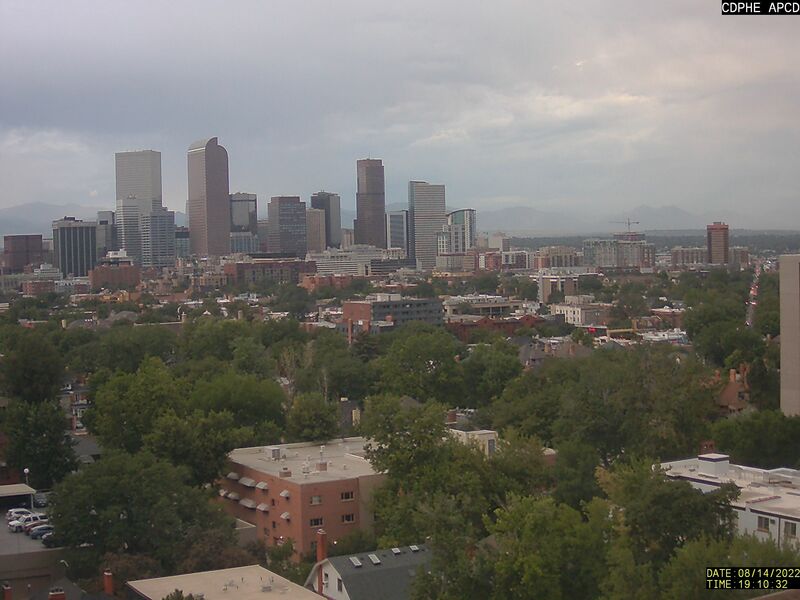 I was home alone Monday night, the Fourth of July, and at about 8:30 pm it occurred to me that by using the Pikes Peak webcam (still images that refresh every minute). 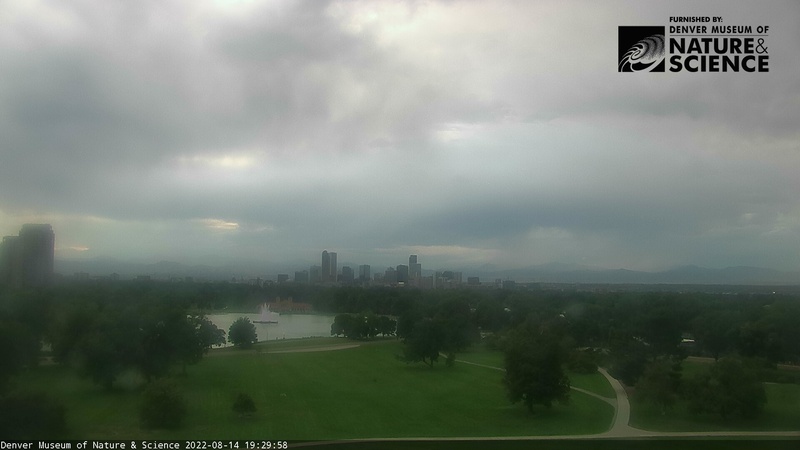 I might be able to see some fireworks in Colorado Springs. (The rotating camera views were down, struck by lightning.) No fireworks were visible, but I was surprised to find a small herd of bighorn sheep browsing right in front of the camera. I don’t know what they were eating; the area looks like just bare dirt. Maybe they were munching scraps dropped by tourists or grain put out by the rangers. Something just out of sight below the camera, at the entrance to the building, seemed particularly attractive. As it grew darker, they gradually drifted away down the mountainside beyond the fence. By 9:15, the last one was gone. I was both startled and delighted. And I completely forgot to look for them again last night. I’m wondering if it’s a habit of theirs to show up every night looking for goodies. They are impressive animals. Saw quite a few years back while floating the Salmon River in Idaho, but all were pretty far away up the mountainsides. Fun, for sure, to view these close up. I particularly enjoyed this because I’ve been in Rocky Mountain National Park several times this year without seeing any. I know exactly where they usually hang out, but they weren’t there when I was. That float trip sure sounds like fun. Remarkable! You are right, there doesn’t seem to be a single scrap of food there. Maybe they did come for the view! Amazing to think that nature is still present, resilient against the forces of civilization! Any day you can look at that camera and see lots of people and often the train. Lots of noise and commotion all day. And yet the sheep come in at night. I guess that makes them scavengers, but why pass up a free meal. I keep meaning to look each evening to see if they come regularly but so far I’ve not thought of it until it’s too dark to see. Ooo, hadn’t thought about that. Certainly could be some natural salt there. More likely that than any kind of food. It would be fun to see that Adaman show sometime, if someone could direct you to a really good vantage point. If you’re correct and there are salt deposits exposed either by weathering or the many footsteps of tourists, I don’t have a problem with their being there. But if it’s trash or other food put out by humans, I’d object. I wish the cam was a live streaming one instead of just still shots once a minute. Then it would be like watching the elk I saw one night on the Tundracam. I watched them foraging, lying down, the calves frolicking, etc. Only happened once, but I was so glad to have the live webcam. I wish they’d get the rotating cam(s?) fixed. 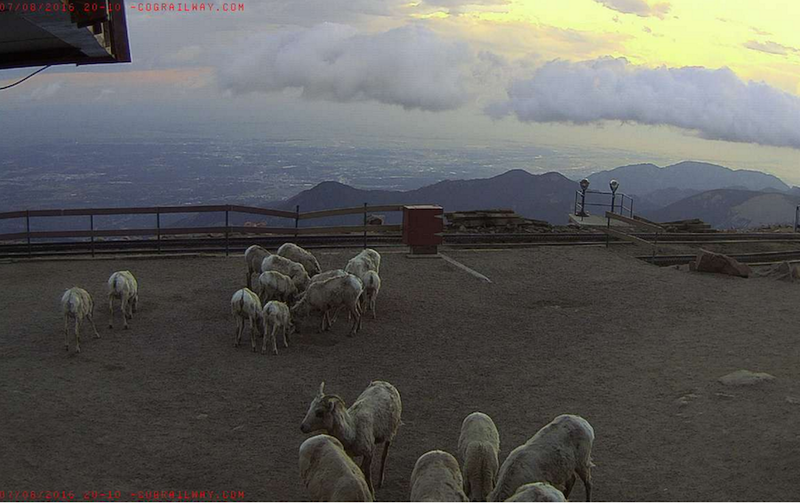 I’m curious to see if the sheep are browsing all across the summit or just clustered where the most people concentrate during the day. I’ve actually thought about breaking out all the webcams into a separate blog. But it would be a lot of work, not to mention that this blog started as a compilation of several older blogs because I got tired of maintaining them separately. Plus the webcams being a big draw helps the exposure of all the other posts (although that’s never been the intent). My guess is rock salt applied to keep the summit area open for those winter tourists, slick mornings, and such, as well as carried by shoes & tires. RMNP Rangers say there are other trace minerals in soils (instead of popping vitamins, we could go slurp up a couple spoonfuls of dirt daily?) such as the salt & minerals there at Sheep Lakes– they’re herbivores, right? Hopefully human trash isn’t attracting them. Never thought about readership strategy that way. True, once on a blog, the usual tendency is to look around. Maybe with the new visitor center, they will upgrade to livecams up there. Makes sense since IP technology is so much cheaper now. But no drones! Salt in one form or another for the road, parking lots, and pedestrian walkways makes sense. You see it around here all the time in shopping centers, etc. I think the state routinely uses mag chloride (more environmentally friendly) on the highways. I mostly just use kitty litter unless the front walk looks particularly bad. Don’t want to get sued if some visitor slips and falls. Ice not a big problem here, though. The snow mostly evaporates before it can melt and refreeze into ice. So unlike Oklahoma.